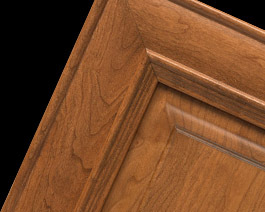 Cherry is the timeless selection for cabinetry. The heartwood of cherry varies from rich red to reddish brown and darkens noticeably with age and exposure to light. In contrast, the sapwood is creamy white. The wood has a fine uniform, straight grain, satiny, smooth texture, and commonly contains brown pith flecks and small gum pockets. When sanded and stained, it produces a beautiful smooth finish. Cherry is particularly prized for the rich patina that develops as the wood ages.